Announcing the 2013 Horse of the Year Nominees; Voting Is Now Open! Lexington, Ky. – To reach the highest level of excellence in equestrian sport requires talent, perseverance, a tremendous spirit and often, unwavering courage. In 2013, six horses have shown the world these qualities and more. On January 11, the United States Equestrian Federation (USEF) will bestow two of them with the prestigious title of Horse of the Year, the highest honor the USEF awards a horse. 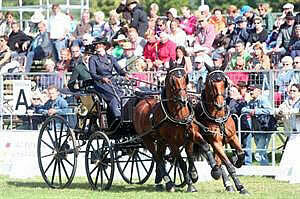 Again this year, both a national and international horse will be crowned. The six champions have earned their places on the elite list as USEF Horses of Honor, and each will be recognized at the USEF Year-End Awards Gala in January – part of the USEF Annual Meeting – at the Hyatt Regency Lexington in Lexington, Ky.
Additionally, each USEF Horse of Honor will be inducted into the Horse Stars Hall of Fame at the Equus Fête Cheval Étoile on Sunday, March 16, 2014 at the Palm Beach International Equestrian Center in Wellington, Fla. It will be up to you to choose the two special horses, selecting from a range of talents across the Federation’s breeds and disciplines. Your vote will help determine the champions that join the pantheon of past winners, including hunter Jersey Boy and jumper Flexible (2012), Friesian horse Sjoerd and eventer Neville Bardos (2011), reining horse Gunners Special Nite (2010), dressage horse Ravel (2009), driving horse Jamaica (2008), eventer Theodore O’Connor (2007), jumper Authentic (2006), and dressage horse Brentina (2005). Pete Kyle’s A Ruf Gal entered 2013 as one of the top reining mares in the country and continued to earn top results in her best season to date. Known as a powerful mare that possesses the grit of a champion, A Ruf Gal has always been highly regarded for her quiet demeanor, which has elevated her to the upper echelons of the sport. Prior to 2013, the talented mare had shown an aptitude for winning as she teamed with owner Pete Kyle along with his wife, Tamra, and son, Reed, to earn many of reining’s top prizes. A Ruf Gal’s phenomenal 2013 campaign began in April with a fifth-place finish in the CRI3* and a Reserve World Championship Freestyle title at the Kentucky Reining Cup. Next she won the CRI3* and the USA Reining Open class at the NRHA Derby in June, before earning co-champion honors in the CRI3* and a top-10 finish in the Senior Reining division at the AQHA World Show. For her outstanding results in 2013, A Ruf Gal earned the 2013 USA Reining Horse of the Year title. Additionally, with her accomplishments this year, she became only the 30th mare to earn over $100,000 in NRHA, AQHA, and FEI/USEF competitions. Prior to the 2013 season, Sam had always been a stalwart for owner and driver Misdee Wrigley-Miller, but in 2013 he stepped up his game when he was needed most. He has continually demonstrated an abundance of heart throughout his career with a particular aptitude for the coaching discipline. On many occasions Sam had been called upon to perform at the championship level of combined driving, but in the summer of 2013 Sam was asked to compete on the world stage, and his answer was a resounding yes. Wrigley-Miller was selected to represent the U.S. at the FEI World Driving Championship for Pairs and when injuries struck, Sam was booked on a Trans-Atlantic journey. He arrived in Germany for the final prep before the World Championships, CAI Riesenbeck, light on match practice, but was undeterred as he drove alongside an inexperienced youngster to help the U.S. earn its best finish ever, fourth, at the renowned competition. Just weeks later, Sam delivered the performance of a lifetime at the World Championships in Slovakia, helping the United States to finish again in fourth place, just five points away from a podium finish. Sam arrived in Europe as a “hail Mary” substitute and left as the star performer of the U.S. team. In 2013, Abigail Wexner’s Simon and his rider, Beezie Madden, scored top finishes for the U.S., both stateside and abroad, and secured their place in the history books with an epic win on the world’s largest stage. They began the year jumping at FTI Consulting Winter Equestrian Festival, where on Week Five they earned a fourth-place finish in the Adequan Grand Prix. Three weeks later during CSIO week, Simon and Madden were members of the winning U.S. effort in the Furusiyya FEI Nations Cup presented by G&C Farm. They would close out the month of April by traveling to Gothenburg, Sweden, where Simon would help Madden to win her first Rolex/FEI World Cup Final title. They began the week with a win in the Speed Leg and continued to jump consistently and bested the Olympic champions, Steve Guerdat and Nino des Buissonnets, by producing a clear round in the final jump-off to win the only FEI Championship awarded annually. Simon continued his streak of strong performances with top placings in Spruce Meadows, including collecting third place in both the PwC Cup and the ATCO Power Queen Elizabeth II Cup. Madden and Simon finished out the year anchoring the U.S. team at the Furusiyya FEI Nations Cup Final in Barcelona, where they once again proved successful in the jump-off to help in the winning American effort in the Consolation Round. Gwendolyn Schmidt had always dreamed of owning and competing a Baroque Pinto in Part-Bred Friesian competition that had the build and temperament of a Friesian and markings of a Pinto. In January 2011, Schmidt boarded a plane to Germany to see a horse that fit the bill. Bizkit has been a horse-of-a-lifetime for Schmidt, and his phenomenal talent and temperament were rewarded in 2013. He claimed three World Grand Championships, one World Reserve Championship, and a World Championship Top Five, in addition to two National Grand Championships, five National Reserve Championships, 16 Regional Grand Championships, three Regional Reserve Championships and one Regional Top Five. At the Buckeye Baroque Summer Jubilee, Bizkit was named the High Point Part-Bred Friesian, and earned the High Point Award at the IFSHA World & National Championship Show. When Schmidt began her search for the perfect Baroque Pinto she had never intended to purchase a stallion, but Bizkit’s many attributes were too special to turn down. He has already begun to share his special abilities and demeanor, as three of his offspring are already excelling in the in-hand divisions. Janet Peterson and Liza Boyd’s Brunello has been turning heads in the hunter ring with his signature style and consistent top placings for years. With Boyd in the tack, the pair has been a fixture in International Hunter Derby competitions since the program’s inception and scored their biggest victory in August when they topped the 2013 USHJA International Hunter Derby Championship in Lexington, Ky. They headed into Saturday standing in second place and proceeded to lay down an exceptional Handy Round to claim the largest win of their illustrious career. 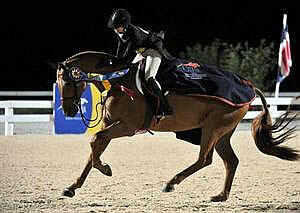 With their win in Lexington, Brunello and Boyd notched their fifth International Hunter Derby win in as many months. Their run began in April when they claimed top honors in the Camden Spring International Hunter Derby and continued into May with a win in the Atlanta Spring International Hunter Derby. In June they again won in Atlanta, topping the Summer International Hunter Derby, and in July they headed the field in the BRCHS International Hunter Derby. Brunello’s success was not just a spring and summer matter, as he was second in the Jacksonville Finale International Hunter Derby before placing second in the WCHR Palm Beach Hunter Spectacular. Callaway’s Annabel Allison entered the record books in 2013 as the first mare to win the Five-Gaited World’s Grand Championship title at the Kentucky State Fair in 14 years. On Saturday night at the Kentucky State Fair, Callaway’s Annabel Allison went down in the history books, topping all three judges’ cards after an exciting four-horse workout against three of ‘the boys.’ In the lead up to her historic win in Louisville, Silver Brook Stables’ impressive mare and rider Debbie Foley earned the Five-Gaited Championship at the Midwest Charity Horse Show. The talented duo completed its 2013 campaign with another Five-Gaited victory at the UPHA American Royal National Championship Show. It took four tries for Foley and Callaway’s Annabel Allison to win the ‘big one’ at Louisville, and 2013 was her best and strongest performance yet. She had been Five-Gaited Reserve World’s Grand Champion in both 2012 and 2010, to Bravo Blue and Courageous Lord, respectively, making her win this year even more meaningful. Callaway’s Annabel Allison is a universally popular winner in the Saddlebred world, and serves as a wonderful ambassador for the American Saddlebred breed. Two of these six exceptional horses will be honored as the overall 2013 USEF Horse of the Year, a mark of distinction that will last a lifetime. Now, it is up to you to decide who will receive the top tribute in 2013. Simply visit https://www.usef.org/_IFrames/hoty/Default.aspx and type in your email address to access the voting portal. Voting will end at Midnight [ET] on Monday, December 30, 2013. For more information regarding the Horse of the Year program or any of the six Horses of Honor, contact Trisha Watkins, USEF Awards Manager, at 859.225.6944 or tlwatkins@usef.org. Previous PostSetting the Stage for the World’s Greatest Indoor ShowNext PostAnnouncing the 2013 Equestrian of the Year Nominees; Voting Is Now Open!